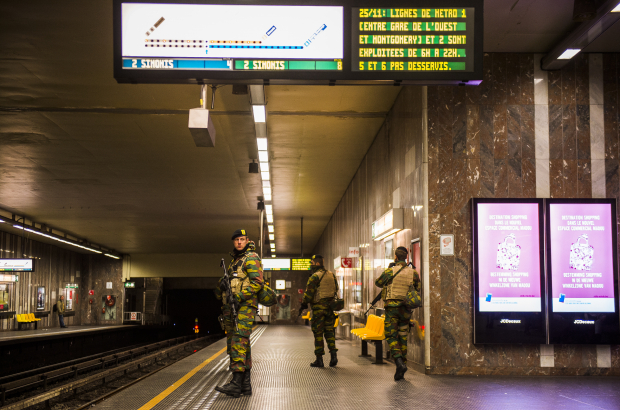 Soldiers will gradually stop patrolling Belgian railway and metro stations from next month, the country's defence minister Stephen Vandeput has announced. Speaking to VTM News, Vandeput said military personnel would not disappear from public transport overnight but their role would slowly be transferred to the Belgian federal police. The reduction in military presence on Belgian transport will be put forward for approval by Belgium's National Security Council - which brings together representatives from the government, police, judiciary and intelligence services. Vandeput said: "The reduction of military patrols will be carried out in consultation with the police and security services and will not be at the expense of security." Soldiers have been assisting police with patrols since the Paris terror attacks in November 2015 and the subsequent "lockdown" in the Belgian capital. They will remain at strategic locations including outside embassies, international institutions and around the Rue de la Loi. An anonymous soldier interviewed by De Standaard newspaper last autumn said military personnel were tired of the Brussels street patrols, which he said had "lasted way too long".